"I walked into one bank and 20 minutes later had a YES"
All of his RTO buddies were opening their own stores - and doing quite well. So after letting them pave the way, Chuck Botts decided it was time for him to go into business for himself as well. 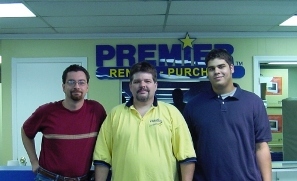 One thing his friends all had in common was a good, successful experience working with Premier Rental-Purchase to open their stores. So too did Chuck. "I didn't look anywhere else," he says. And for him, everything went as expected. "Financing seemed to me like an impossibility," he admitted. "Trooper Earle helped me put together a plan that banks couldn't say 'no' to. With Premier's plan, I walked into one bank and 20 minutes later had a 'yes'. It proved to be the easiest part." Chuck appreciated what followed. "Premier laid out a plan to get started, put all the pieces together for me. Like the others, I knew how to rent and collect, but I didn't know how to do other operations. What Trooper did for all of us resolved everything we didn't know." A ten-year veteran of the RTO industry, Chuck has built up a client base and an excellent staff that will join him in his new store in Nashville. He'll continue what he has done well for a decade - provide excellent customer service. "I believe you service your customers to death, treating them with dignity and respect." Chuck's store will be located at 2638 Nolensville Road, Nashville, Tenn. 37211 (phone number 615-782-7201). His hours will be Mon -Thurs 9-6. Fri 9-8. Sat 9-5.